Before replacing an open fuse, disconnect the negative battery cable. 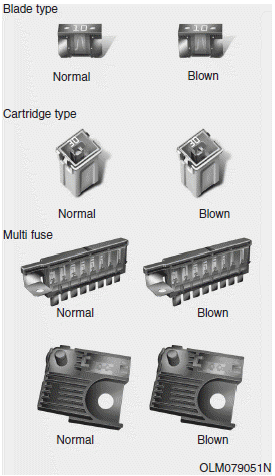 When replacing an open fuse or relay with a new one, make sure the new fuse or relay fits tightly into the clips. The incomplete fastening fuse or relay may cause the vehicle wiring and electric systems damage and a possible fire. Do not remove fuses, relays and terminals fastened with bolts or nuts.The fuses, relays and terminals may be fastened incompletely, and it may cause a possible fire. If fuses, relays and terminals fastened with bolts or nuts are open, consult with an authorized HYUNDAI dealer.